I've recently left Ubuntu and migrated to a new GNU/Linux distribution: Arch Linux. 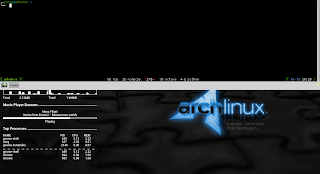 The process wasn't easy, as the learning curve of Arch Linux is steeper than the Ubuntu learning curve, but it has been immensely gratifying. This metamorphosis has taught me more about Linux that what I could have learned from staying in Ubuntu. Not only have I learned new things but I have built a fully customized Operating System that fits my needs and boosts my productivity. 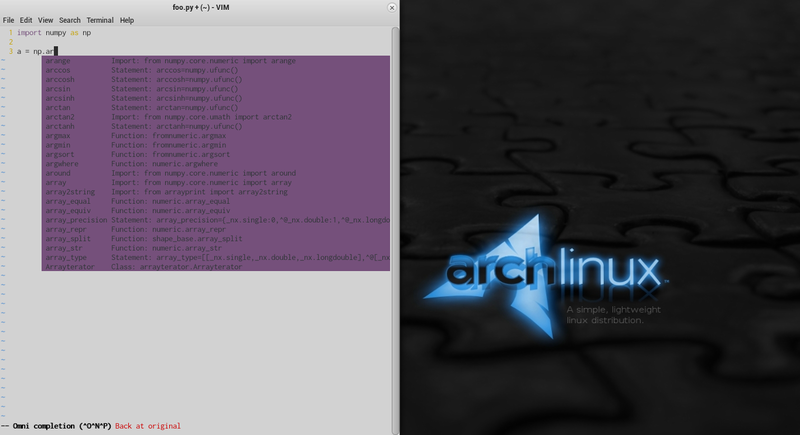 This is the main difference between Arch Linux and Ubuntu, the former comes with the bare minimum to run, whereas the latter comes with batteries included. 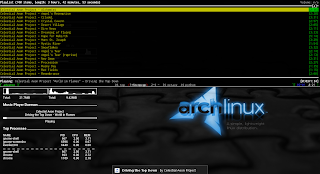 This implies the Arch user must choose his/her Desktop Environment, his/her Development Tools, his/her Media Player, his/her Web Browser, etc. 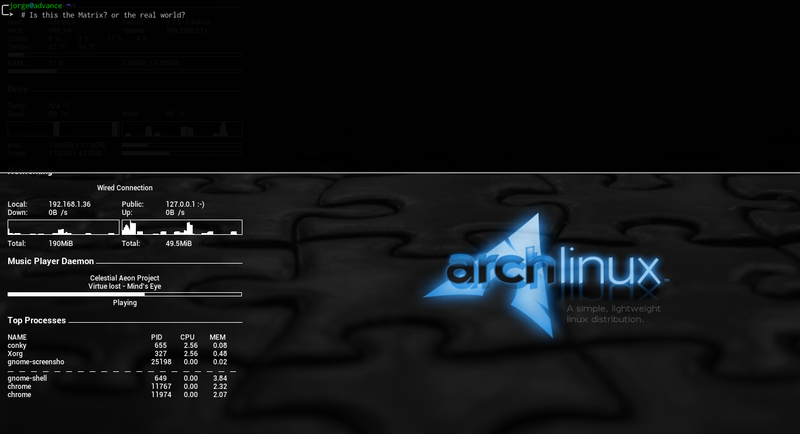 This plethora of choices may be overwhelming for the newcomer but this ultimate freedom is Arch Linux strongest feature. I believe that thanks to being forced to choose, the user will ultimately find what best fulfills his/her needs instead of sticking to the default, which may not be the optimum. This search for the best apps may be time consuming, but I think it eventually pays off in terms of productivity and conform. Now, without further ado, I'll share my findings, what works the best for me, and I hope this insight will help you in building your ultimate Operating System. 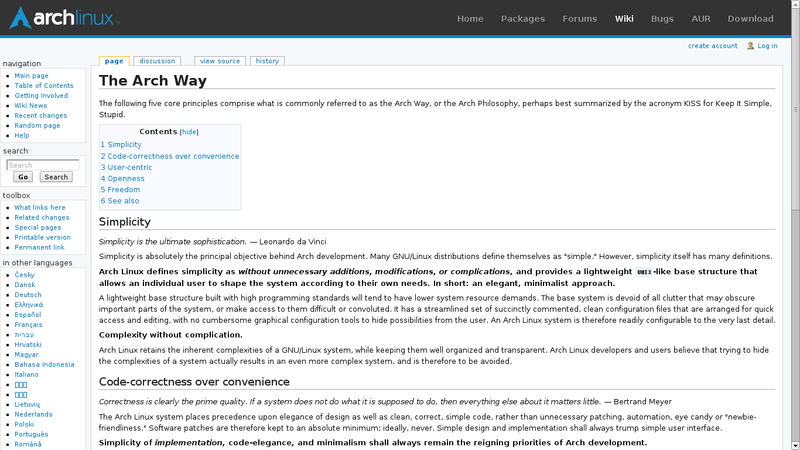 It's important to mention that a I've received a lot of help into building and tweaking my system from the Arch Wiki. The information contained there has taught me a lot about how Linux works, has saved me lot of time troubleshooting problems and has provided helpful insight on selecting and setting up software. Arch Linux is a rolling release distribution, this means you won't see a new version of Arch Linux coming out every 6 months, like Ubuntu does. Instead you get access to new software as soon as it has been tested to be relatively stable. This means you'll live at the cutting edge and have access to the latest features implemented in your favorite software, but also means you should be ready to tackle the bugs that may come with the latest software. 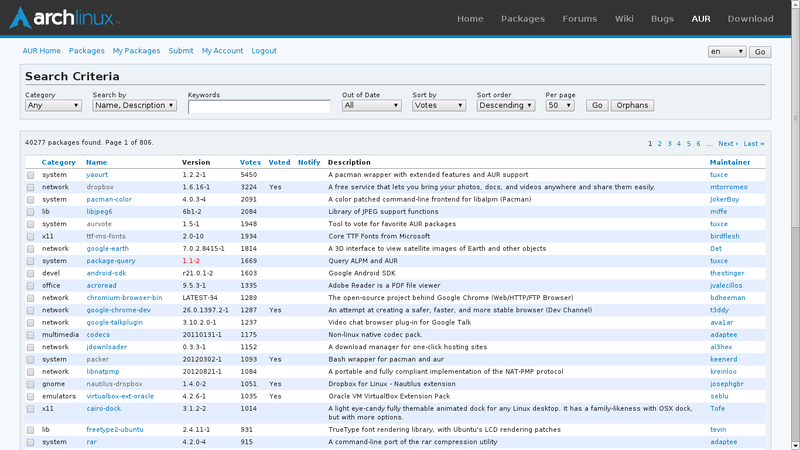 The User Repository: Build It Yourself! 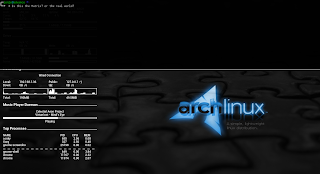 As with other GNU/Linux distributions, you can easily install software from the packages available in the official repository using pacman, the Arch Linux package manager. But there are times when you need a software that isn't available in the official repository. On many distributions this either means that you are on your own and will need to compile the software from source, or you depend on someone who might have built a binary compatible with your distribution/version. 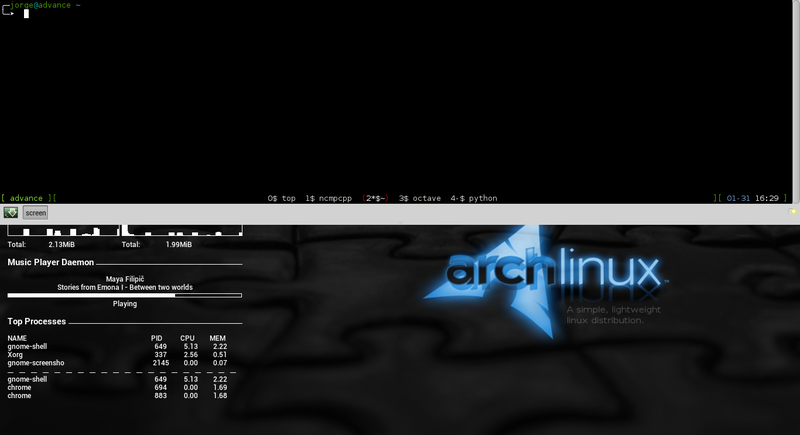 On Arch Linux, you have the AUR (Arch User Repository), where the build instructions (PKGBUILD) are uploaded. This means that you'll build yourself a binary that does work with your system. And for the exciting part, AUR has system for commenting, voting and flagging outdated packages. This means that the community will be alert and vigilant about the correctness of the build instructions. My first Linux distro was Ubuntu 11.04, Natty Narwhal, and I arrived just in time to test Unity, which became the default GUI in that release. Coming from the "W" OS, the change was abrupt, and for me it was a total redefinition of the desktop experience. I quickly became attached to the feature of workspaces, which are common in Linux Desktop Environments, and even established the policy of having one application per workspace for faster switching, instead of alt-tabbing through many apps. I loved the concept of adding extensions to the top panel for extra information and features, but to the date I still don't understand why some people use the application extension, that just reminds me of the start menu from the "W" OS (ewww), I guess some habits die hard. 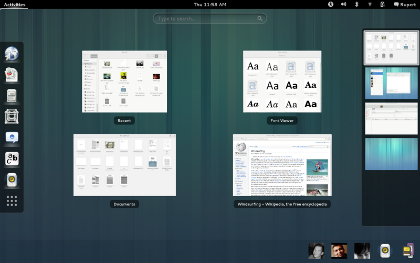 Out Unity, enter Gnome 3! 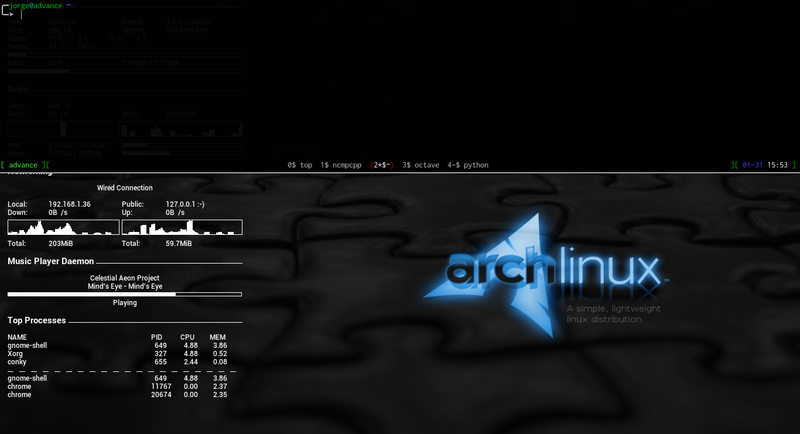 But enough of reminiscing, and fast forwarding to my migration to Arch Linux. Just after I installed the base system and had to select a Desktop Environment, I found out that Unity was not in the official repositories and I didn't know at that time about AUR. 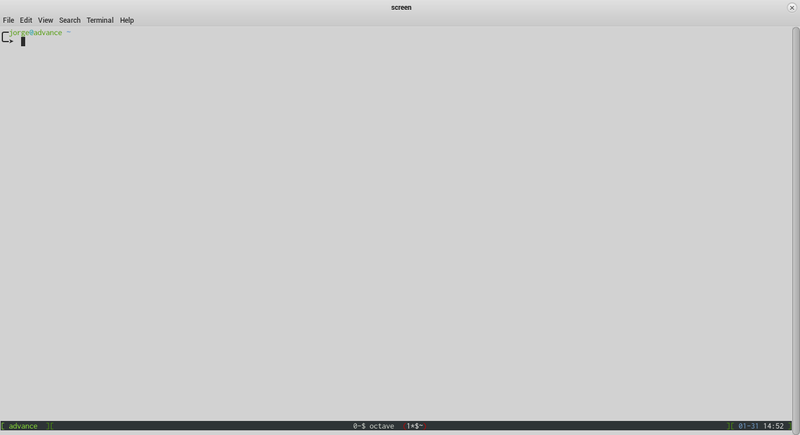 In need of a new DE, I choose the most similar to Unity: Gnome 3. It just looks better than Unity! 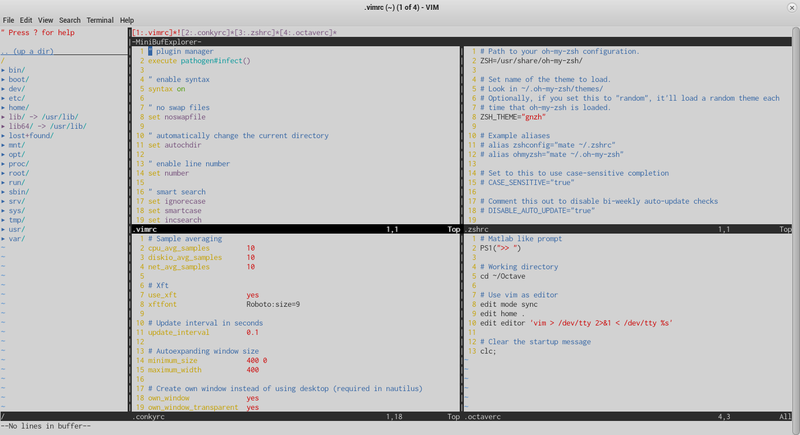 Continuing with the productivity improvements, I decided to try the legendary vim editor. 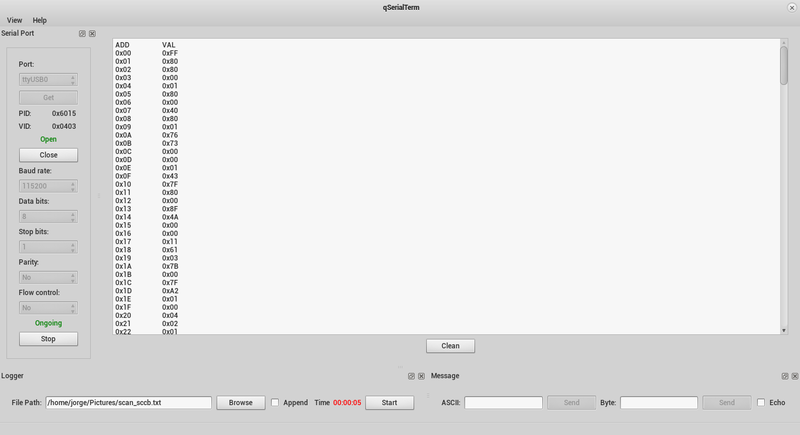 Many things are said about vim like: "vim allows you to edit text at of the speed of thought". I'm not quite there yet, but releasing yourself from the mouse does speed up the editing, but only if you're a touch typist and after you have quite a bit of practice with this editor. The learning curve is quite steep, when I started with vim my productivity went down, but after the struggle of learning the basics I was back to normal. What gives you the real boost are vim superpowers, namely: buffers, windows, the infinity of plugins and some stuff I haven't heard about yet. I think you get the point... The side effect is that I'm improving my productivity daily! I'm a heavy user of the command line, I prefer using the keyboard that using the mouse, and pressing a key shortcut is always faster than moving the mouse to some menu and selecting an action. Therefore I needed a way of quickly accessing multiple terminals. Opening and closing terminal when needed resulted in launching delays, and having multiple terminal windows open only added clutter to the desktop. With Drop Down Terminal you can have a terminal permanently open, which can be hidden from view without closing it and called it back without the launching delay. 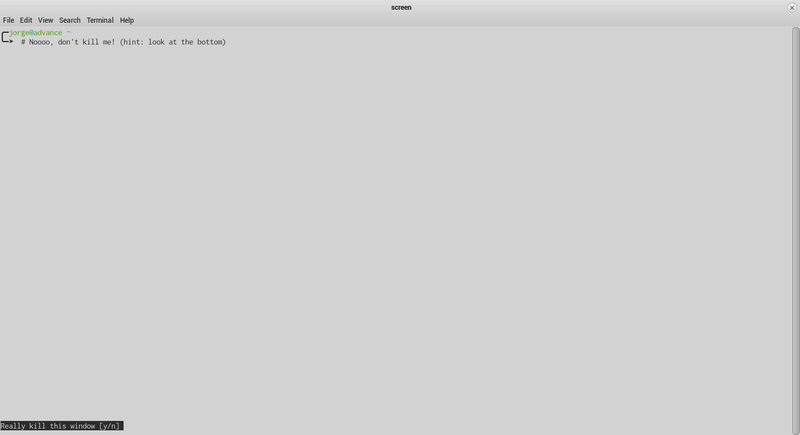 And Screen lets you manage multiple command line applications in one terminal. 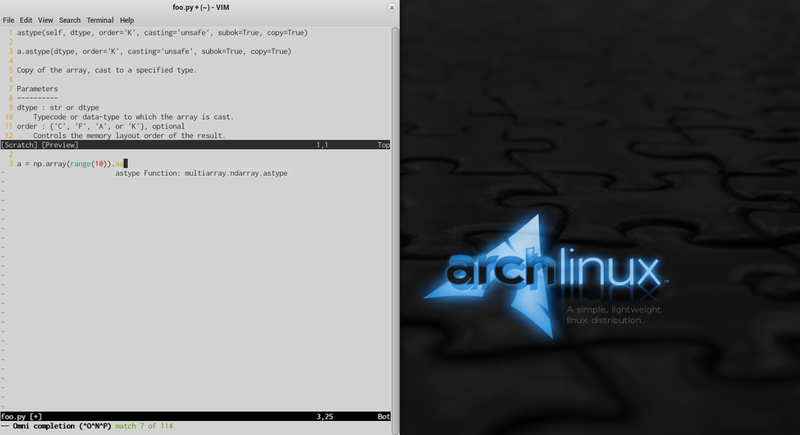 For more information you can check my post: Multitasking in the command line with Screen. Accessing your system information is important to spot any CPU/memory leak, or to monitor the network bandwidth usage, among other tasks related to maintenance. You'll fill your top panel with a lots of indicators, leaving little space for other extensions. Again, due to limited space you can only view a small piece of information for each indicator. To access a more detailed report, you'll need to click on each indicator, which is slow and energy consuming. 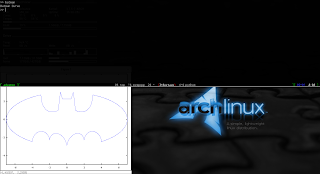 With Conky, you can get rid of all or most of the indicators in the top panel. 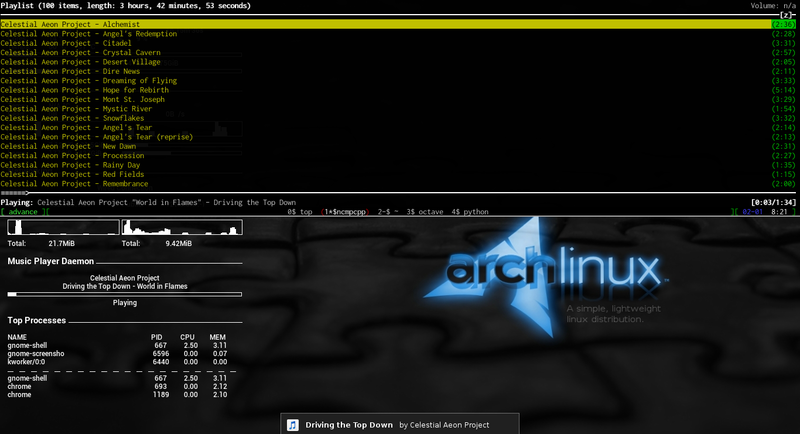 You can customize Conky to display all the information you want/need. 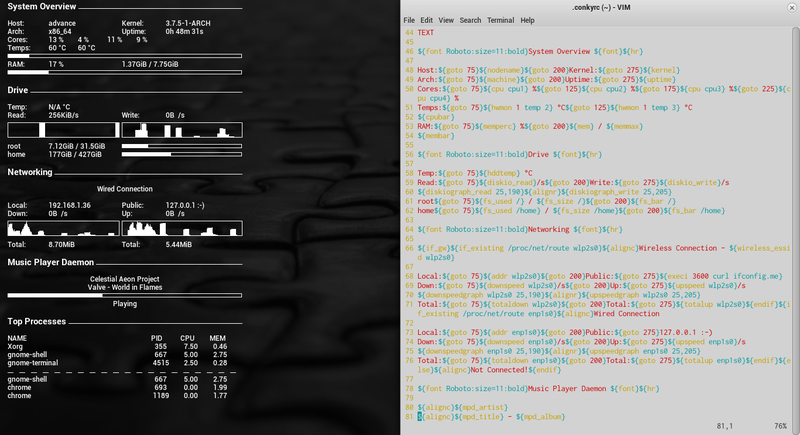 You can easily access to Conky using a keybinding to show the desktop, which is way faster than the mouse. Bash is a great shell, but the Z shell is easier to customize, which can give you superpowers if correctly customized. Using the out of the box version of zsh feels a lot like bash, but thanks to the project oh my zsh, you can get a fully customized zsh that beats vanilla bash. Double tab, let's you choose among the list of suggestions. Auto cd, you don't need to type the cd command, typing only the name of the directory is enough to change the file path. With the Git integration, you can add to the shell promp information about the git repository you are currently in. MPD + ncmpccp, a ncurses based client. The Music Player Daemon (MPD) is a daemon (a process that runs in the background) that uses your audio device to play music stored in a certain folder (the database) according to the order established in the playlist folder. However to send commands like play, pause, next, etc to the MPD, a client is necessary. My choice of client is ncmpccp, which is a terminal based client that uses the ncurses library to implement a user interface. The rationale of the selection, is again that the keyboard is faster than the mouse, also not having a GUI saves resources and finally this client can be integrated in my drop down Screen. I have also installed mpDris2 and a gnome extension to control MPD via the top panel, this combination also enables notifications, which you can see in the above screenshot. Those are the applications I use everyday and that have boosted my productivity. There are many other applications that I use but they may not be so useful for the average user. If you are an Archer, please feel free to share your favorite application in the comment section. "Screen is a full-screen window manager that multiplexes a physical terminal between several processes, typically interactive shells." - definition from GNU Screen website. As the definition says Screen allows you to run multiple processes/shells in one terminal, this is priceless when you are sshing a remote server. 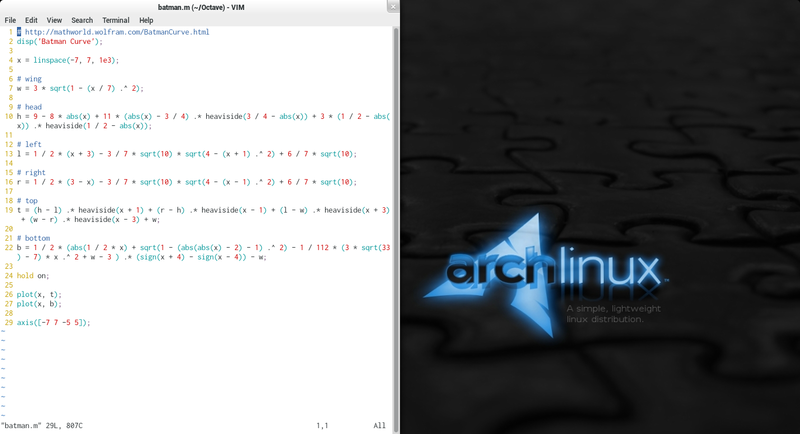 However you can use the powers of Screen to do some command line multitask in your everyday life. 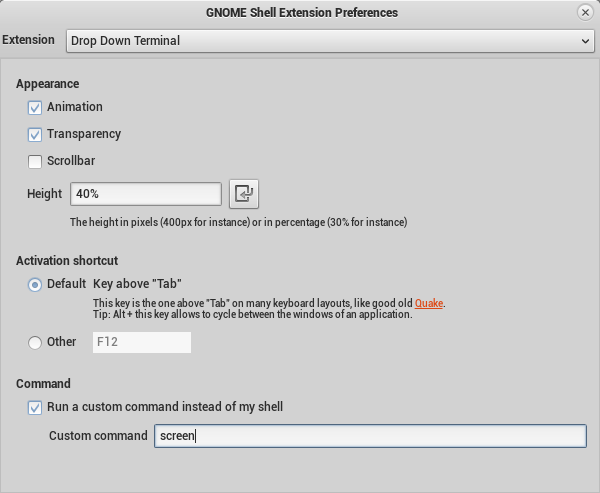 I'll cover how I use both Screen and the the Gnome Drop Down Terminal (alternatively Guake can also be used). If you use Guake, you might say: "but I already have tabs in Guake, I don't need Screen". That's as debatable as the topic of Buffers vs Tabs in Vim, but everybody knows that Buffers beat Tabs everyday (OK, that's just my opinion). Install Screen from your distro repository if you haven't already. And let's see what Screen can do. 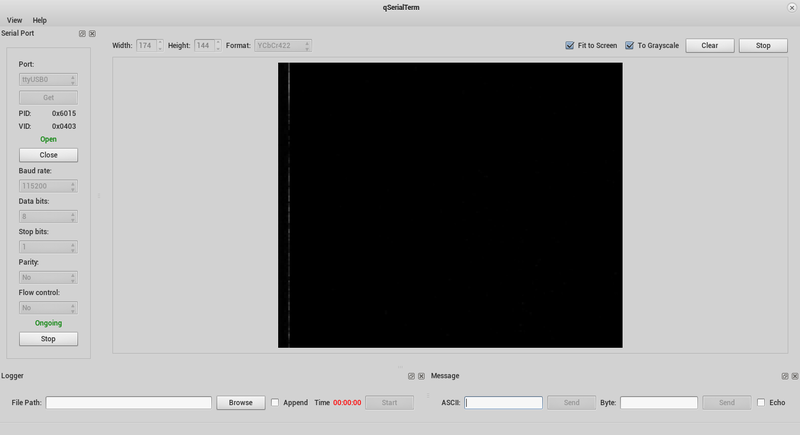 Notice the gnome-terminal screen now says "screen" in the title. 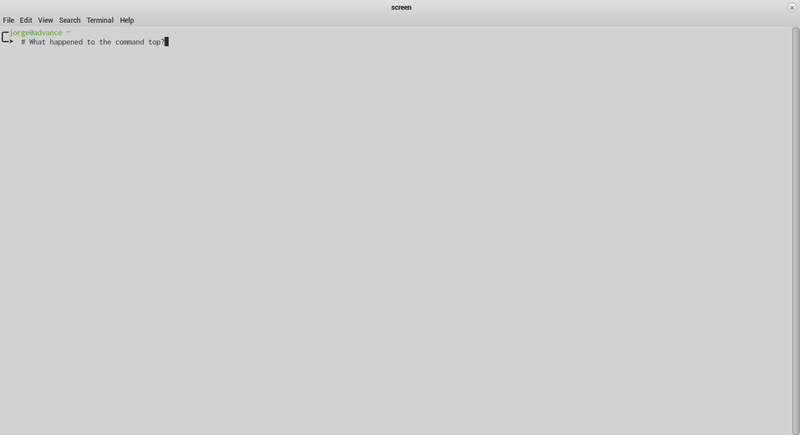 Some splash screen appears, you press enter and then looks like nothing happened... But something did happen, you are now in a Screen session! You'll now see your running processes order by CPU usage. Now type: 'C-a c' (press both Ctrl and A, release both keys and then press the C key). Creating a new window in a Screen session. You have just created a new window and you watching this second window. 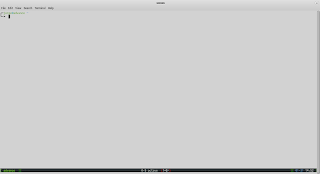 The command top is still running in the first window, just that is not visible. You can switch between these two windows using 'C-a n' or 'C-a p'. Finally, you can "kill" a window using the command 'C-a k'. You'll see a prompt at the bottom, asking if you really want to kill window. Killing a window also terminates the process contained in it. Killing a window an a Screen session. There are other commands, you can learn more about them using the help command 'C-a h'. There is another important feature of Screen named attaching/detaching, which is extremely useful for ssh connections, but I won't cover that here as it's not necessary to do the multitasking, as you'll see soon. How do I know if I'm in a Screen session? I can't visually tell whether I'm in a Screen session or not. If you run screen inside a a GUI terminal like the gnome-terminal, is easy to notice that you are in a Screen session because the title changes to "screen". On Guake is also easy to notice, as the tab name changes to "screen" accordingly. But on the Gnome Drop Down Terminal you've got no way to tell. You can't tell either if you are on an X-less login session. 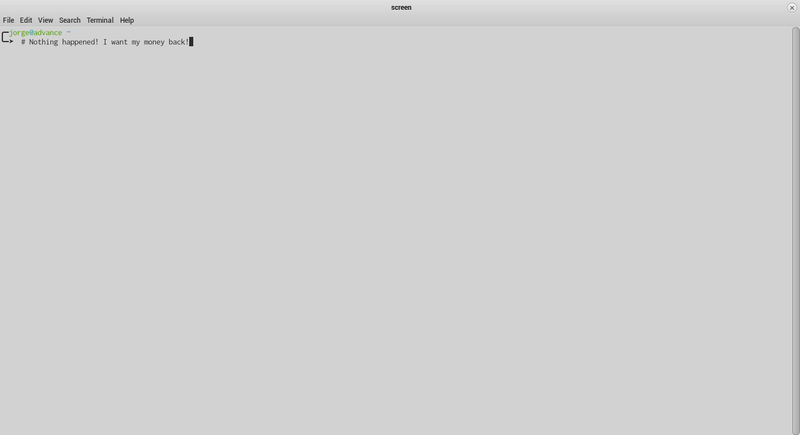 At less not visually, but you can always test if 'C-a h' displays the Screen help. A better way of telling Screen session apart is adding a status line, this line can also display other important information. Before adding that feature, we need to lean about the screenrc file. As with many other applications, Screen has a rc file that executes certain commands at every startup, you can think of it as a configuration file. We'll work with the .screenrc file found in your home folder, that rc file only works with your current user account. Each keybinding has a description right next to it, for your reference. As a final step let's integrate Screen to a drop down terminal for the ultimate command line multitasking experience. 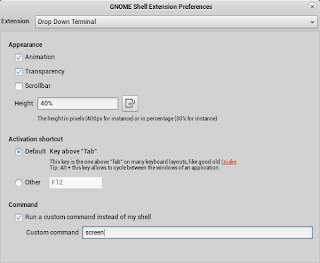 For the Gnome Drop Down Terminal, the process is straightforward: Simply head to the preferences of the extension and select screen as the custom command to run instead of the shell. You can start Guake with some applications in it at startup as I explained in an old post (I used Octave as an example in that post). But using Screen and the .screenrc file is way simpler! 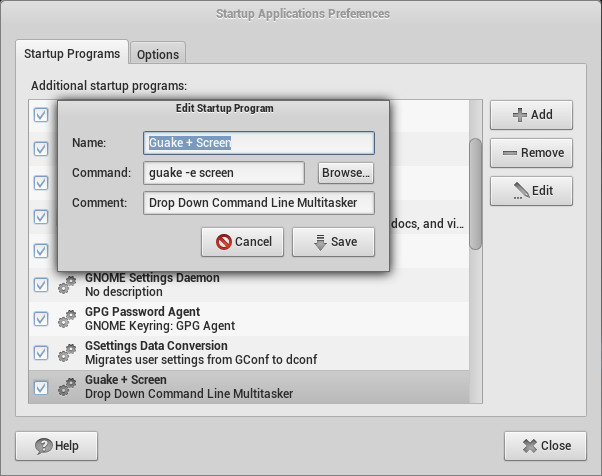 You'll need to run 'guake -e screen' instead of just guake, and the screenrc file will take care of launching your apps. 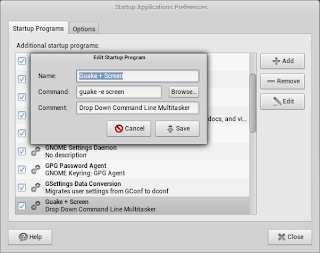 The easiest way is to configure Guake as a startup application. Launch Guake with Screen inside it at startup. I hope this post was useful to the heavy users of the command line and also pushes the casual users to get into it. 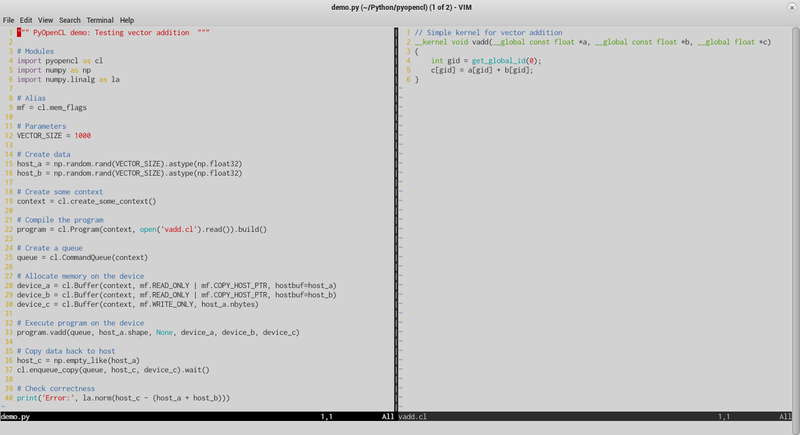 Testing a PyOpenCL demo in vim. This is my collection of hacks that turn vim into a python IDE. Adding this to the .vimrc file will enable PEP8 indentation only for *.py files. I use the great jedi-vim plugin from David Halter and the SuperTab plugin. 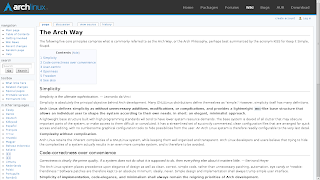 You can find the installation steps at RedKrieg's post: Writing Python like a Jedi. This is my favorite, press the F5 key to save the python script and execute it. Add this to the .vimrc file. To enable all the filetype features I've defined above the following lines are needed in the .vimrc file. Here is a collection of other useful plugins, I recommend installing them using pathogen if you can't get them from the repositories of your Linux distro. miniBufExplorer, for easier navigation of buffers. NERDCommenter, fast comment toggling with <leader>C<Space>. UltiSnips, snippets for fast code completion of commonly used blocks. If you have hacks of your own, please share them with everyone in the comments section. Yup, that mess of wires actually works. 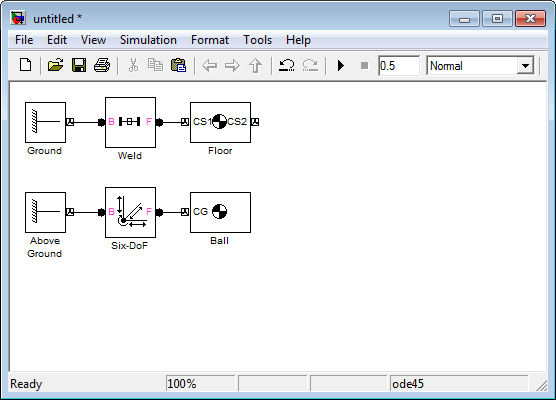 In this post I'll cover 3 basic demo programs for the STM32F4 to interface the OV7670. Additionally, I've use qSerialTerm to receive data from the uC and display it in a human readable form. I assume you know how the OV7670 works and have some knowledge about common peripherals found in uC (GPIO, USART, DMA, etc). The board used in this demo was the custom development board: F4Dev. The STM32F4DISCOVERY wasn't used and can't be used because the Digital Camera Interface (DCMI) peripheral pins are not fully available in that development board. I've used bareCortexM, an Eclipse based IDE, and libstm32pp, a template peripheral library, to develop these demos for the STM32F4. The STM32F4 operated at 42 MHz, the system clock, the AHB clock, the APB1 clock and the APB2 clock, all of them operated at this frequency. 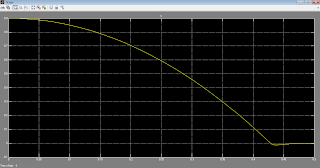 This 42 MHz frequency was obtained from the uC High Speed Internal (HSI) oscillator, which runs at 16 MHz, after scaling up the frequency using the uC internal PLL. The MCO1 pin was configured to output the HSI clock (16 MHz) and this output was used to drive the OV7670 XCLK. In this first demo, the STM32F4 will interface the OV7670 using a bit bang implementation of the SCCB protocol. The uC will wait until the letter 'S' is received on the USART1 interface. Upon receiving this signal, the uC will read all the internal registers of the OV7670 using the SCCB interface. After scanning all the OV7670 registers. The uC will report the address and values of the registers via the USART1 in a human readable format. You can find the log file of the uC output here. Under the hood details: The formatting was done using the printf function. 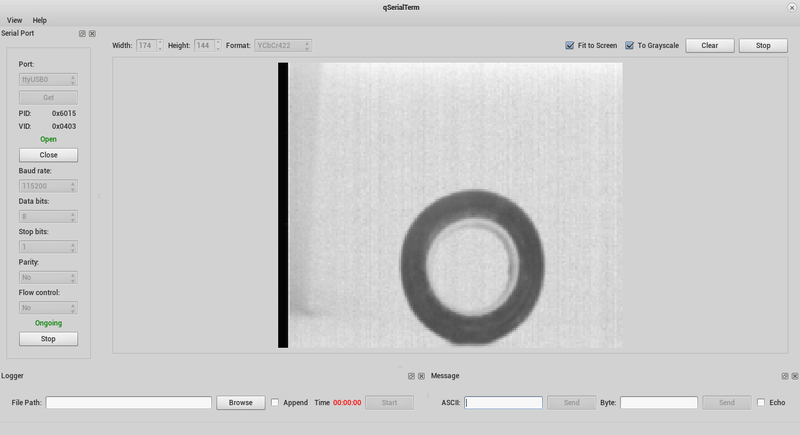 In this second demo, the STM32F4 will interface the OV7670 using the Digital Camera Module Interface (DCMI) to grab a frame from the OV7670 and then display the data in hexadecimal format. The uC will wait until the letter 'S' is received on the USART1 interface. 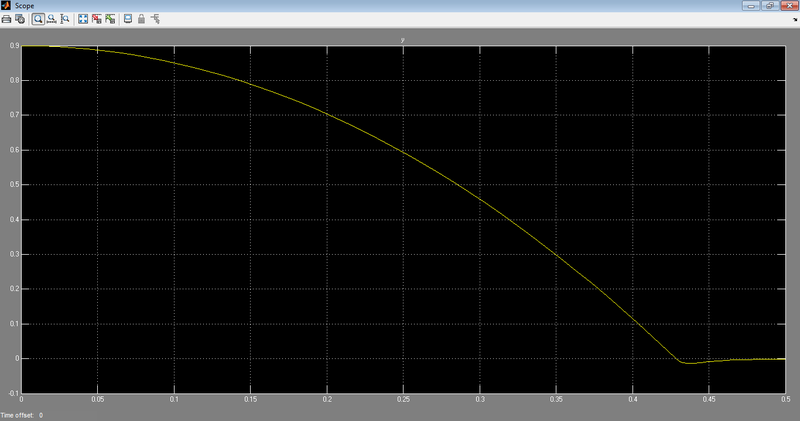 Upon receiving this signal, the uC will use the DCMI in single shot mode to grab one frame from the OV7670. After capturing the frame, the uC will send all the data via the USART1 interface in a human readable hexadecimal format. Frame taken in a pitch black environment. Data in hex format. 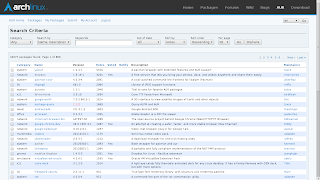 You can get the full log file here. Under the hood details: The DCMI peripheral works hand to hand with the DMA peripheral. The data that is captured by the DCMI is moved by the DMA to a predetermined memory address without intervention of the uP. 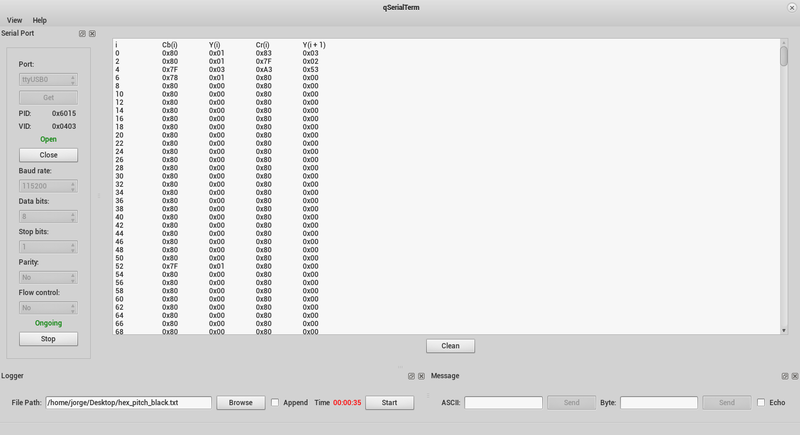 The formatting was done using the printf function. The last demo is pretty similar to the second demo. The difference is that the uC reports the frame data in binary form. On the PC side, this binary data is parsed and displayed in qSerialTerm. Frames captured by the OV7670. Left: A electrical tape. Right: Pitch black image. Under the hood details: After capturing the frame, the data was sent through the USART interface using the DMA peripheral. That's it. You have access to my full code, both the STM32F4 firmware and the qSerialTerm are fully available to you. I hope this information will help you in projects that involve the OV7670. 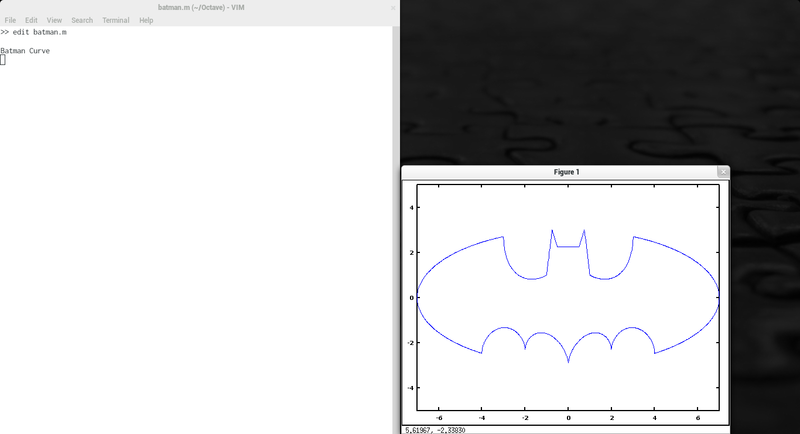 Integrating the powerful mathematical package, Octave, with the flexible editor, Vim. 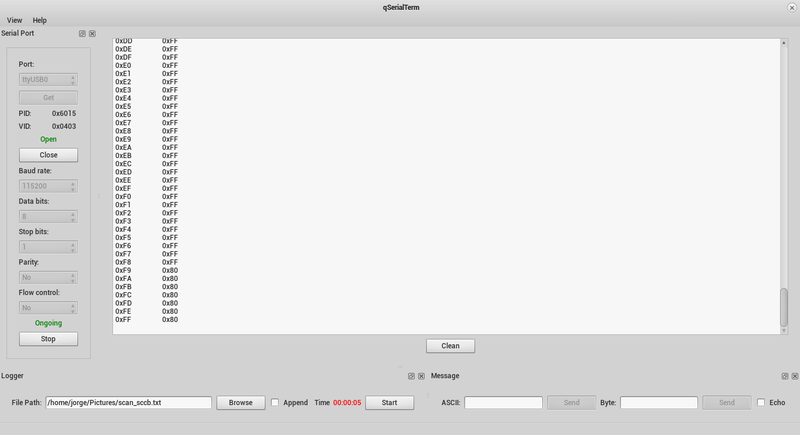 Today, I'm sharing some tips to use the vim editor inside the Octave interactive command line. The first thing towards customizing Octave is creating an .octaverc file, if you don't have one already. The .octaverc file holds some Octave commands that are executed every time you launch Octave. We'll work with the .octaverc file that lives in your home directory, which is user specific. Now you can call vim from within Octave, and use it in command line mode, i.e. without opening an (unnecessary) additional window. As a bonus you get a function template. Now, let's tweak vim for extra features! We'll add syntax coloring/highlighting to vim. Similar to the .octaverc file, vim also has a configuration file named .vimrc. Before touching the .vimrc file, you'll need to grab a vim syntax file from here (grab the latest version). Next you'll need to drop that octave.vim file in the following directory: ~/.vim/syntax. Next, you'll need to append the following lines in your .vimrc file. Let's try editing a file inside Octave again. Added Octave syntax highlighting for vim. Here is where the magic comes in. With this hack, you'll be able to test the octave script you are editing in vim, inside vim and without leaving vim. In other words, you'll be able to use the F5 key to run your script, just like you do in the Matlab editor. Executing an Octave script from within vim using the F5 key in normal mode. "pkg load all" at the beginning of your code. Which grants access to all functions inside the extra Octave packages. "pause" at the end of your code. Without this you won't be able to see the plots drawn in your script. When the execution of the script finishes, these two lines are removed. That's all folks, happy coding! 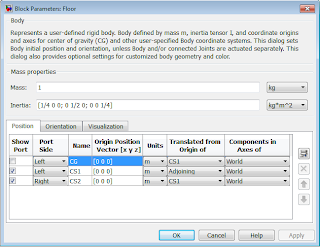 I'll demonstrate how to simulate a floor in Simmechanics, this floor will prevent free falling (6 DOF) objects from falling below a threshold level ("the floor level"), i.e. I will simulate a collision/interaction between the free falling object and the floor. 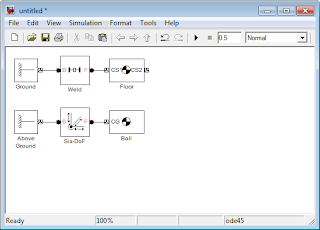 I'll assume you have a basic understanding of how Simmechanics works. If you don't, you might want to check this post. If you have used Simmechanics before, then you know it's an excellent toolbox for simulation of multibody dynamics. You can easily work with robotic arms, which are always fixed to the ground. But what happens when you want to work with legged robots, that can't be fixed to the ground. Well, then you run in a problem, if you don't fix any part of the robot to the ground, then the robot will fall and fall by action of the gravity. Removing the gravity is not an option, because you want to design the controllers of your robot with gravity compensation, even worse your robot will float if you simulate a zero gravity environment. Let's develop a minimal model to illustrate the problem: a 6 DOF ball. We'll start by drawing the floor. 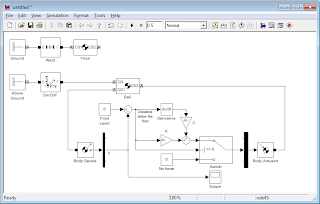 Implement the following block diagram in Simulink. 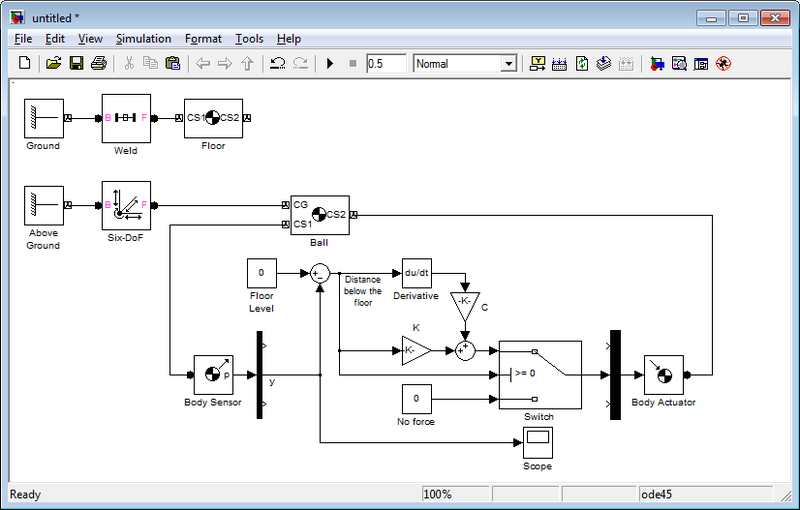 Block diagram to visualize the floor. 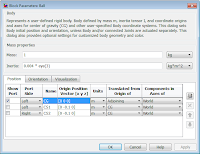 Modify the Floor block parameters to match the following image, and also on the Visualization tab change the Body geometry option to "Equivalent ellipsoid from mass properties". 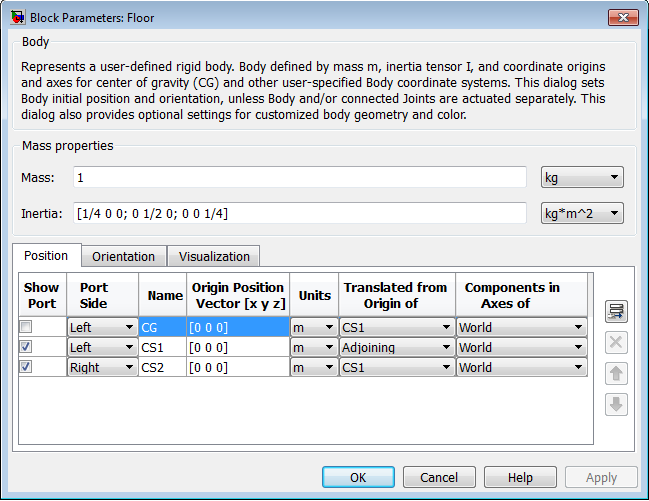 Parameters to draw a 1 meter radius floor. Next, start a simulation. 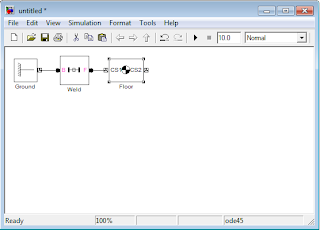 Activate the the Isometric View and the "Enable Automatic Expanding Fit". 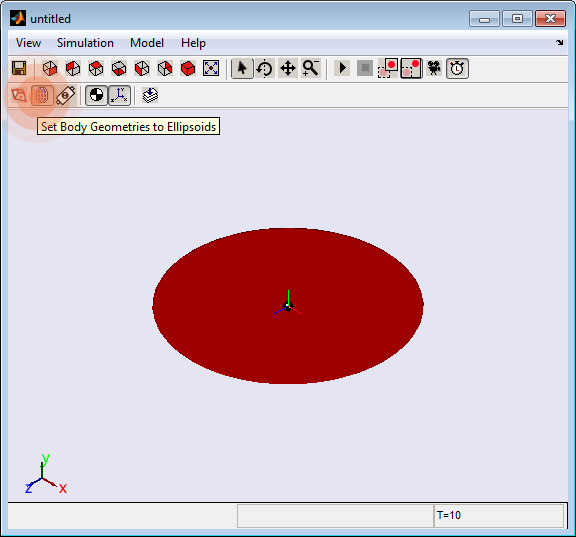 Animation showing the floor as a 1 m radius disk. Now, we add the free falling ball. Add more blocks to the model to match the following diagram. Added a free falling ball to the model. Next, modify the parameters of the Above Ground block and the Ball block, to match the following images. 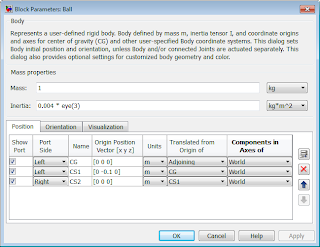 On the Visualization tab of the ball block also select "Equivalent ellipsoid from mass properties" on the Body geometry option. 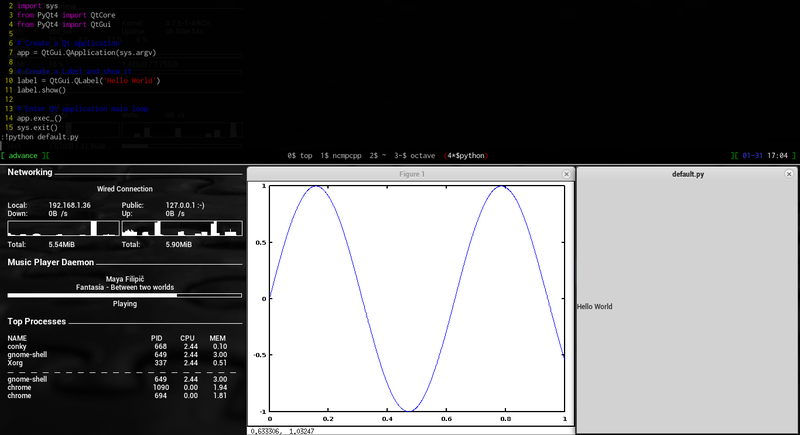 Now simulate the system and observe the problem. Ball falling through the floor. Known the problem, we must now create a solution. Let's begin by analyzing how the floor behaves. Ideally the floor is a rigid body that exerts enough force over adjacent bodies to prevent them from falling through. Now, perfect rigid bodies doesn't exist in the real world, all bodies deform when stressed or compressed. 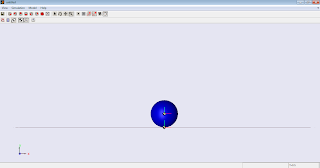 This means our floor model must be elastic, this can be modeled as a spring. Our floor model can't be modeled only as a spring, otherwise will end with a trampoline. When we fall to the ground, we don't jump back to the sky, instead our potential energy dissipates as heat or as permanent deformation. This means our floor model must also have a dissipation element. That description resembles a lot to a mass-spring-damper system. As you might know those system tend to vibrate, unless they are overdamped. This means our floor model must behave as an overdamped mass-spring-damper system. 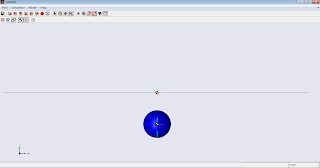 The final condition is that the free falling object must be the mass of the system, this means that our floor model doesn't really has a mass parameter. Other way to think of it is that the mass is detachable, and this mass is only affected by the spring and the damper when is at or below the floor level. 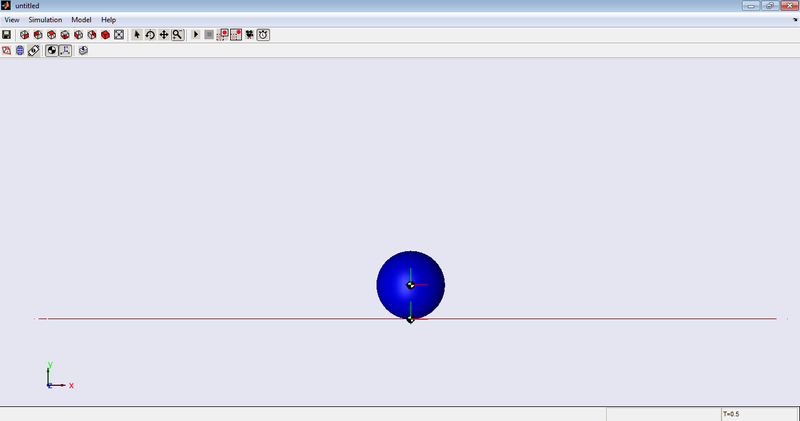 First, let's enable some sensor/actuator ports on the free falling ball. These two ports must be located at the same point, at the bottom of the ball. Adding sensor/actuator ports to the free falling ball. 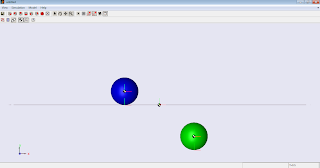 The body sensor is configured to output the position in meters, while the body actuator is configured to exert force in newtons over the ball. 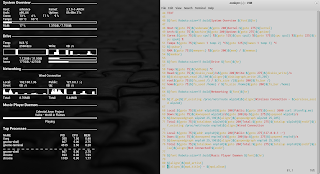 Using a demuxer, we extract the Y component of the position, then we compare it to the floor level. If the Y position of the bottom of the ball is below the floor level, then we activate the spring-damper system represented by the gains 'k' and 'c', otherwise the floor exerts no force over the ball. The force developed by the spring damper system is exerted over the ball but only in the Y direction, thanks to a muxer and the body actuator. The damping ratio "c / 2 / sqrt(m * k)" should be greater than 1, to guarantee overdamping. The free falling body will sink a distance "m * g / k" into the ground, so you might want to increase 'k', right? 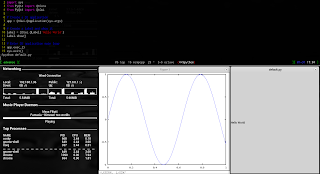 But Increasing 'k', also increases the computation load of the simulation. 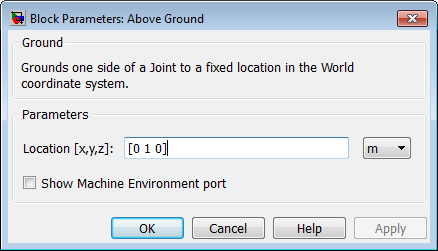 How do I select the parameters 'k' and 'c'? I first select 'k' balancing how much sinking and computation load can I tolerate. Then I compute 'c' using the biggest mass and choosing a damping ratio of 1. I'll leave you with the simulation output. 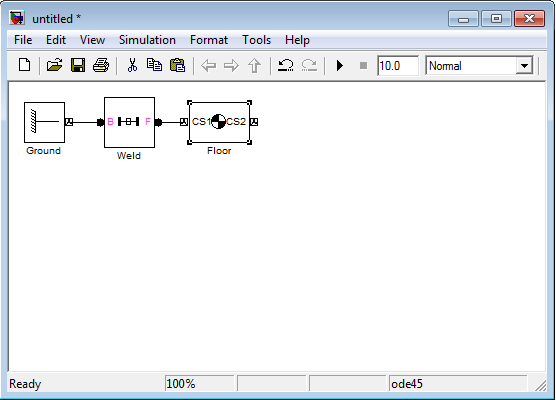 As a closing remark, I must say that I have used this method in the simulation of a humanoid robot with positive results.